A pastor in the “Church of the Desert”, Jean Jarousseau exercised his ministry in Saintonge at the end of the Heroic Period and during the time called the Period of Tolerance. We know about him thanks to the biography written by his grandson, Eugène Pelletan. Jean Jarousseau was born on Christmas Day 1729, in the small Cognac village of Mainxe on the edge of Saintonge. As his father and grandfather were preachers, his family remained faithful members of the Reformed Church. From his adolescence the young man took part in “Church of the Desert” meetings, which were held in the woods of Mainxe, Chassons and Segonzac. On the death of his father, probably hung for being a preacher, the family’s assets were seized. Jean Jarousseau went to Switzerland. On his return to France, he began ministering in the Cevennes alongside the pastor Paul Rabaut, with whom he struck up a friendship and kept up a correspondence until Rabaut’s death. 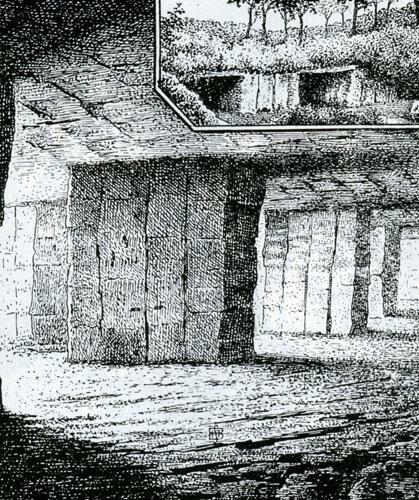 In 1754 we find him in back Saintonge working alongside the pastor Jean-Louis Gibert. The same year, at a nightly assembly at a place called La Combe à la Bataille, Governor Pons and a few king’s soldiers showed up. Jean-Louis Gibert stayed calm and prevented panic movements by having them disarmed and attending the five-hour worship. Later on, as they could not attack directly, cunning was used, but Gibert and Jarousseau were cautious and managed to get away. In December 1757 he was sent to the Lausanne Seminary. He studied there until April 1761. In May 1761, at the synod of Saintonge, Angoumois, Perigord and Bordeaux, Jean Jarousseau was solemnly consecrated to the “Holy Ministry”. He served the churches of Cozes ; Royan ; Saint-Georges-de-Didonne, Meschers, Mortagne, Saint-Fort, Gémozac and Pons. Thanks to Marshall de Sennecterre, Governor of the Saintonge region, and a friend of Voltaire’s, severity towards the Protestants was alleviated. The Heroic Period for the “Church of the Desert” ended, and Jean Jarousseau was able to exercise his ministry under better conditions. On the 4th January 1767, at Saint-Georges-de-Didonne, he married Anne Lavocat who brought him a somewhat more comfortable existence. Pastor Dugas blessed the newly-weds. They went on to have seven children. In case the pastor was ever pursued, a hiding place was prepared in Anne’s house. His sermons which still survive show a preaching aimed at the ordinary public and that he urged faithfulness, respect of each other and a moral life. 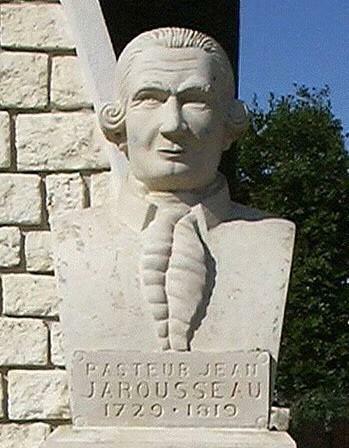 After the publication of his grandson’s book, Jarousseau, pastor in the “Church of the Desert” (Jarousseau, pasteur du désert), which made him famous, Jarousseau undertook a journey to Versailles in 1780 to meet Malesherbes, minister of Louis XVI, and the king himself, with the aim of putting the case for freedom of conscience. He also met Parmentier who gave him some potato plants. There is no documentary evidence of this secret meeting at Versailles, but the introduction of the potato to Saint-Georges-de-Didonne is well known. Jarousseau even grew them in his own garden. During the Revolution the pastor helped the priest of Saint-Georges to flee. After this he was elected to local government positions before retiring to Chenaumoine, a village of Semusac, where he died on 18th June 1819. Pastors of the "Church of the Desert"